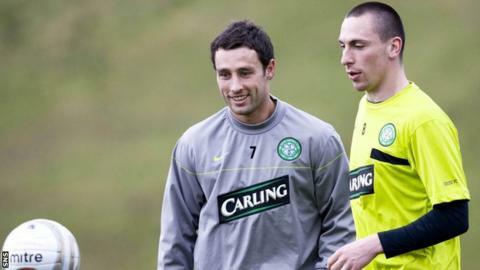 Scott Brown would “most definitely” make an impact in Australian football but has been tipped to stay at Celtic by former team-mate Scott McDonald. Brown, 33, is out of contract at the end of the season and has been linked with Western Melbourne, who have just been admitted to the A-League. McDonald, 35, played with Brown in Glasgow for two-and-a-half years. “There’s no question that this is the real deal, this offer he’s got from Melbourne,” said Australian McDonald. “Now that this team’s been accepted into the league, I know a couple of people who are involved and they’re dead set. They’re desperate to get him over there. “They see his leadership qualities. They’ve seen what he’s done for Celtic Football Club. Brown, whose side host Dundee on Saturday, made his 500th appearance for Celtic in Wednesday’s 3-0 win over Motherwell and has captained the club to their current run of seven successive top-flight titles. However, he has been left out of the side in recent weeks. And McDonald said on BBC Radio Scotland’s Sportsound: “It’s a phenomenal achievement, 500 games.